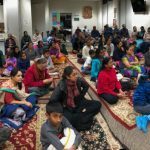 Milwaukee devotees were very fortunate to have had a series of Satsangs, Pravachans and Kirtans during the Thanksgiving weekend Thursday,Nov 24th till Saturday,Nov 26th. 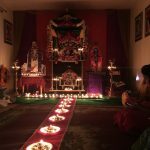 Suriji and Umaji started off the series of Thanksgiving Namasankirtan events with Mahamantra chanting and bhajans accentuating the greatness of Rama nama at their residence, Thursday morning. 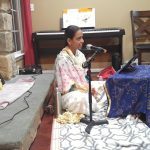 Thanksgiving Part-2 was celebrated at Priyaji & Thulasiji’s residence with Mahamantra chanting and Guruji’s Kirtans on Saturday evening. 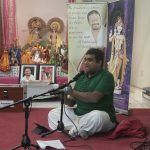 New families that joined the Satsang event also enjoyed the program and felt very happy to be a part of it. 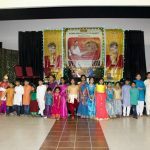 The Sunday Krishnalaya Gopakuteeram was also a memorable one as the little ones and the grown-ups were engrossed in the enchanting form and lilas of Govardhana Giridhari. Parents also participated enthusiastically in His Live Play. 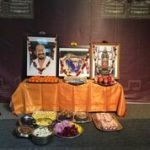 Overall a great weekend to be Thankful for Krishna to come alive every time His devotees sang and talked about His glories! What a sensational weekend… Milwaukee residents are truly blessed!